Ranger Committe members, left: Adalia Maudlin, Chairman; Valroy Maudlin, aide; Bob Bailey, aide; Mike Goodson, fish identification; Ken Wright, nautical knot tying; and Linda Wright, photographer. The F.O.R. 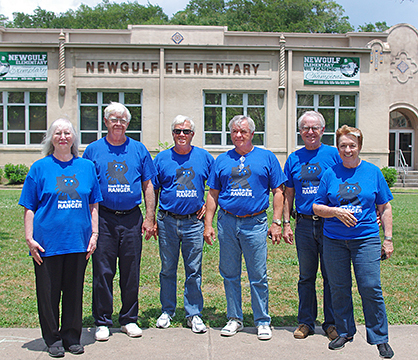 Ranger Committee presented a San Bernard Watershed program to three fifth grade classes at Newgulf Elementary School on Monday, May 7. Newgulf is on top of the Boling Dome, reputed to be the largest known inland deposit of sulfur in the world, in the extreme eastern corner of Wharton County between the San Bernard River and Caney Creek. The Ranger watershed program explores the San Bernard from its headwater to its mouth. Classroom materials including booklets about the watershed, fish identification and nautical knot tying were distributed. The goal of the program is to help the students gain a better understanding of the San Bernard and to inspire them toward environmental stewardship of the river. Ranger t-shirts were also given to each student and three lucky students received a new rod and reel. What a great bunch of kiddos. They seemed very interested. Thanks to the F.O.R. volunteers, too!